An accidental recipe that I made for lunch and I ended up eating it for lunch, dinner, and again at lunch the next day. Healthy eating doesn’t have to be complicated, it just has to taste so dang good that you want to eat it all the time. Start by bringing whatever broth you use to boil. I highly recommend my broth recipe. You can cut the recipe in half to make a smaller batch. Cook the vermicelli according to package directions. 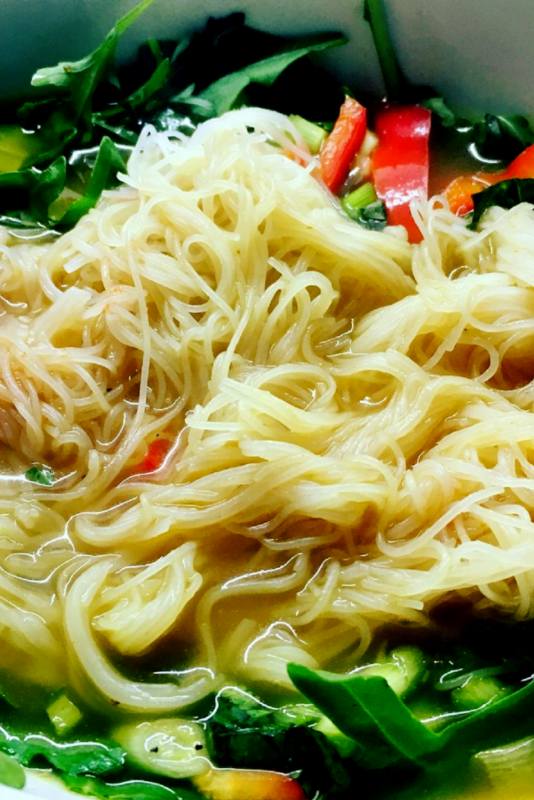 While the vermicelli cooks, prepare your bowls. Add a large handful of the arugula to the bottom of the bowl. Next, add some red peppers, onions, and basil on top of the arugula. Divide evenly amongst each bowl. Once the vermicelli is ready, add however much you want on top of the veggies. Next, add your flavours of lemon juice, hot sauce and soy sauce. To finish it off, add 2-3 ladles of hot broth to each bowl and eat. You will need a spoon and a fork for this deliciousness.